The messy creative fun of carving a pumpkin for Hallowe'en. 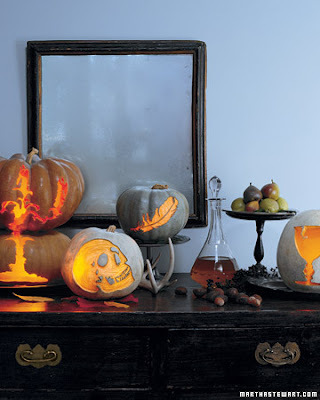 (This atmospheric still life with pumpkins was inspired by the tales of Edgar Allan Poe). Via Martha Stewart. 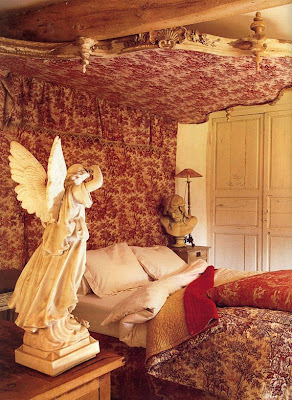 In the office of Franck, a Louis XVI day bed is covered with a 19th century striped damask. Behind the 18th century wrought iron and marble table, a church candlestick is topped by a crown of painted wood. 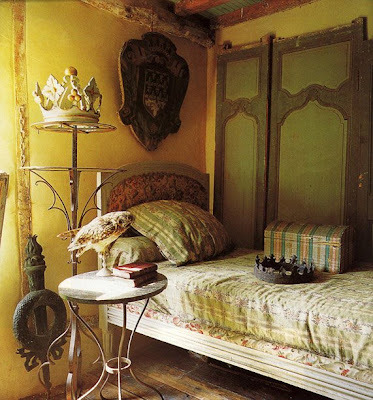 Above the bed hangs a painting representing the arms of the city of Amiens. Against the wall lean Louis XV panels of wood with their original paint. In the small dining room, a statue of polychromed wood stands before a heavy canvas curtain. As is traditional with farms in the region, the walls are paneled horizontally with elm planks. On the floor is the original brick paving. 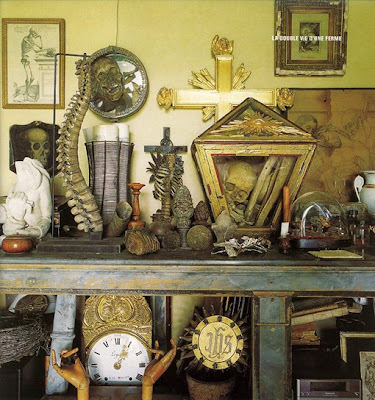 On an antique console, a still life designed in the spirit of 18th century curiosity cabinets includes religious artifacts, skeletons, old books and fragments of sculptures, 17th century prints and 18th century drawings. 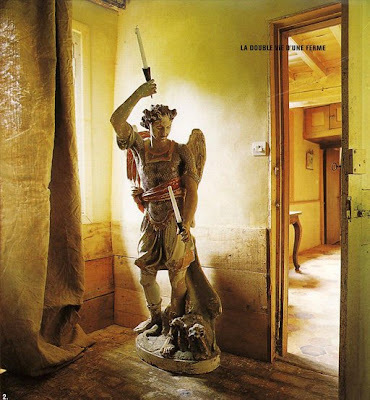 Photo stylist Franck Delmarchelle and antique dealer Laurent Dombrowicz transformed their modest eighteenth century farmhouse in Picardy, France into a surreal home filled with the unexpected. Here the curious visitor, cautiously exploring, happens upon such surprising inhabitants as the stuffed ostrich residing in a box in the former stables, the cat sleeping for eternity on a pedestal, the rabbit throne in the kitchen, and the owl on the night table who watches over your sleep. Living here is to step straight into the pages of the fairy tales of the Brothers Grimm, where the strange and the unexpected are part of everyday life. If you'd like a little bit of this fantastical world for your very own, Franck has a shop on rue du Poitou in Paris called Et caetera, where you can find items much like the ones in the Picardy farmhouse. Scanned from an early 2000ish copy of Marie Claire Maison.